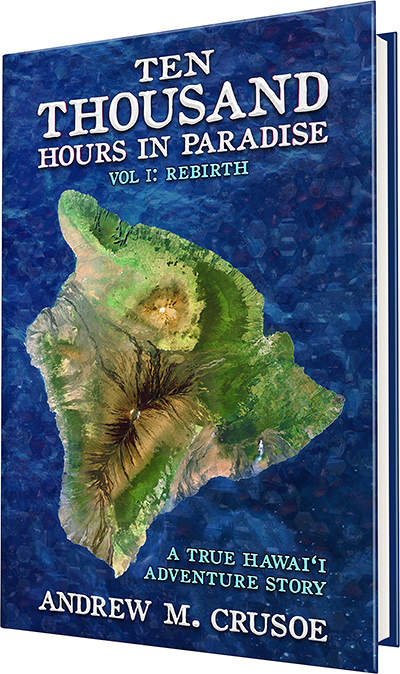 As part of your bonus for your pledge level, you get samples of my current work-in-progress "Ten Thousand Hours in Paradise." Keep in mind that this is mostly unedited, and I'm trusting you to please refrain from sharing this anywhere. UPDATE: I've decided to give this 1st excerpt away for free! I radiate deep gratitude to everyone who helped make this book possible. If it isn’t completely clear yet, everything in this book actually happened. However, that isn’t to say that my memory is perfect, and some events may differ from others’ recollections. In pursuit of accuracy, I have recalled everything to the best of my ability, cross-referencing from my journals, correspondence, and photographs. Only the names have been changed, because that’s apparently what one does when one writes a memoir. Yet this book is unlike any memoir you have ever read: it is a taste of true adventure on the most remote population center on the planet, a place that I have been honored to call my home. Thank you, Hawai‘i. I realize now that you are indeed alive, and I feel such gratitude for our connection. You have given me greater awareness of how I relate to the Earth, to the life on it, and to myself. Truly, you have inspired me forever, and I hope my story within this book will inspire the reader, too. So take a deep breath, and hold onto your heart. For years, when people asked me where I grew up, I hesitated because, quite frankly, I didn’t really know the correct answer. My birthplace is easy: Fremont, California. But when we moved across the country to Wisconsin when I was just four years old, I didn’t think we’d ever return. I still have dim memories of Morgan Hill and some of the other cities we lived in on the West Coast, but the bulk of my childhood was spent in the Northwoods of Wisconsin, where winters would sometimes dip down to -40°F and snowstorms were a serious driving hazard. The seasonality of the Upper Midwest was often awe-inspiring and beautiful to me. The summers and autumns I spent enjoying the lakes and trees were treasures of my childhood, but by the time I was in my teens, I realized that I was living with roughly six months of cold weather per year, and it was starting to wear on me. So when my father had an opportunity to go back to California for work, I felt a mixture of trepidation and raw excitement. After all, I had lots of aunts, uncles, and cousins there, many of whom I was close to. We moved in early August, hauling most of our valuables fully two-thirds across North America to the West Coast, back to the same city I had been born in fifteen years earlier. While there, I taught myself the basics of website development, reconnected with my numerous cousins, and even made some short films with them, cultivating a love of video editing that I still have to this day. And nearly four years later, we did it again in the opposite direction, moving all the way back to Wisconsin. I’ll save the details of that story for another time, but in retrospect, I often wonder if my propensity for going outside of my comfort zone was perhaps part of my family culture. After all, I had no less than seven different addresses across six different cities before I turned fifteen, and I strongly feel that moving so often forced me to become more adaptable and comfortable with change. In fact, it wasn’t until writing this book that I realized how profoundly the experience of being an outsider again and again shaped me and prepared me for my solo travels as an adult, including my journey to Hawaii that would change me forever. After a few years back in Wisconsin, the long winters once again wore on me, and I couldn’t help but feel that it was time to live somewhere with milder seasons. So when I graduated from college, I shot out of the state like a spring from a broken pocket watch, using websites like Craigslist.org and Couchsurfing.com to explore parts of North America that I’d never seen before. Nearly 10,000 kilometers (6,000 mi) and five and half months later, I returned home with a newfound courage and sense of self that I hadn’t had before. That journey deserves a book of its own, but even as I stretched myself through those experiences, a bigger goal loomed in the back of my mind: Hawaii. I cannot pinpoint the exact moment that I started dreaming about Hawaii. I had long enjoyed the Hawaiian language and music, but as much as I’ve scoured my memory and my personal notes, I cannot find a specific initiating moment nor can I remember when I first heard about Hawaii or first dreamt of walking along its white sands. It is my mission to reach financial freedom. I will travel to Hawaii and Europe. As time went on, my goal to go to Hawaii made its way into my daily written affirmations, and as I grew into myself, I realized that going to that remote archipelago wasn’t just something I wanted to do; it was something that I had to do. Through all of my travels, I had learned how my intuition often possessed an intelligence beyond my conscious mind. Experience had taught me to trust myself, so when my head, my heart, and my intuition all gave me a green light to go to Hawaii, I knew that it was time to go, even though I didn’t know a single person there. Once my first book finally wrapped up its editing phase, I began to seriously research what it would take for me to spend at least a month on Hawaii, just to get a feel for it. And the more I researched, the more excited I grew. Even though it was technically part of the United States, I got the feeling that it was like another country altogether, wilder and more raw than any place I’d ever been. And the beauty and wildlife drew me like no other place ever had. In my research, I discovered the term “intentional community,” which is a planned residential community designed from the ground up to have strong social connections and often a high degree of teamwork. I came to learn that there were many kinds of intentional communities, from ecovillages to retreat centers to co-housing communities. And they often consisted of like-minded people who held a common vision, such as living sustainably or having a shared meditation practice. I discovered websites listing intentional communities across the globe, and through those sites I learned that most intentional communities on Hawaii allowed guests for short and medium durations. I also learned about work-trade, which is the practice of directly trading one’s time for a good or service. In the case of most Hawaiian communities, it meant room and board in exchange for a certain number of hours of work per week. The work-trade opportunities would allow me to stay on Hawaii at a more affordable rate, and with more stability, than anything else I’d seen; and by the time my first book came out in paperback six months later, I had set up an agreement with a Community that I felt was a good match for me. And it just so happened to be on the Big Island of Hawaii. April 19, 2013 was the day my life changed. With only a Kestrel pack and a surge of excitement running through my veins, I watched from my window seat as a barren landscape rushed by, a dark field of jagged, otherworldly rock. Before I could give it another thought, I felt a slight jolt as the aircraft settled onto Kona Airport’s only runway, just a few hundred meters from the edge of the island itself. The island looked much drier and rougher than I had imagined, and I was reminded of what I’d read during my research. An island of contrasts, the west side of the Big Island was dry, but the east side was a true rainforest. The landscape would be greener when I got to the Community in a few days. The photos had assured me of that. What I didn’t know, what I couldn’t have known, was that I would stay for far longer than the month or two I had planned. I also couldn’t have predicted that someone would manifest a blue feather for me out of nowhere, that I would get to hike up to the edge of a molten lake of lava, or that I would, in the end, fall in love. As we pulled up to the gate, excitement grew within me, and I was immediately struck by how small the Kona Airport was. Across the tarmac, I noticed a small collection of light brown buildings with steep roofs. Then they opened the doors, and we gradually filed out of the aircraft. I followed a ramp downward, and wearing my Kestrel pack containing everything of value that I owned, I set foot onto the hot dark tarmac, touching the ground for the first time in over five hours. The warmth of the sun filled my body as I walked, and a bright idea hit me. It wasn’t every day that I was this close to such a beautiful aircraft, and I turned around and snapped a few photos of the stunning Boeing 737-800 that I flew in on, complete with winglets. Then I made my way through the airport, past a rainbow of people, most of whom were sitting on the long wooden benches in the gate areas. Thankfully, these were all sheltered from the sun, but the buildings were without walls, allowing a crisp cool breeze to pass over us. Then I realized: the air. It was different, charged somehow. And it smelled sweet and pristine; the cleanest air I’d ever breathed. It was incredible. I considered how I was going to get into Kona town. My research had revealed that there was no bus service from the airport into town, and the thought of paying $20 for a mere 12 km (8 mi) trip wasn’t exactly my first choice. Back in Wisconsin, I’d read extensively about the culture of the Big Island, doing everything I could to prepare myself for the inevitable culture shock of coming to the most remote population center on the planet. Despite most people calling it the Big Island, I learned that the true name of the island was Hawai‘i (roughly pronounced huh-vai-ee). The comma-like symbol in the name was called an ‘okina, and it denoted a brief pause in pronunciation. I would need to keep that in mind since I would soon encounter more of the Hawaiian language than I ever had before. Most of what I’d read in my research had discussed, or at least touched on, how common and effortless hitchhiking was on the Big Island. I had hitchhiked several times before, so I wasn’t too worried as I walked along the shoulder of the airport road toward Mamalahoa highway, a two-lane road that had appeared to be quite hitch-able from the satellite photos I’d studied a few days before. A row of tall palms lined one side of the pavement, and I walked beside them, noticing the utter absence of a sidewalk. Despite the palm trees, I got the distinct feeling that few people had ever walked along this shoulder, and I felt slightly embarrassed. Still, my unconventional path was mild compared to some of the things I’d done, and indeed would soon do. The road stretched on much farther than I’d anticipated, and as I passed the turnoff to the airport parking lot, I stuck out my thumb. Perhaps I could get a ride without walking all the way to the highway. It was worth a try. Sweat began to form on my forehead, and I wiped it away. All I had to do was reach the highway. Then hitchhiking would be a cakewalk. Dozens of cars passed me without another thought, and doubt gnawed at me. No, I had to remain positive. After all, these were mostly tourists, the most wary of all drivers. A silver car that I’d seen earlier was heading back to the airport but unexpectedly pulled off to the side of the road, pointing toward me. The window slid down, and a man with grey hair called out to me.